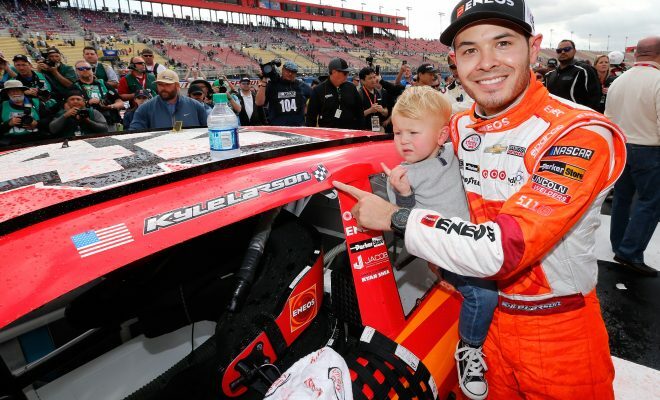 (VIA NASCAR Wire Service) FONTANA, Calif. — Kyle Larson kept pole-sitter Joey Logano at bay after a restart with four laps left in Saturday’s Service King 300 NASCAR XFINITY Series race at Auto Club Speedway and held on to win by .127 seconds. 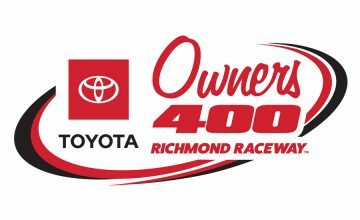 Larson and Logano had swapped the lead on three successive laps before Brandon Jones plowed into the outside wall on Lap 142 to bring out the seventh and final caution of the afternoon. The lead cars pitted for fresh tires under the yellow flag, with Larson exiting pit road first and Spencer Gallagher grabbing the second spot with a two-tire stop. That proved Logano’s undoing, as his No. 22 Team Penske Ford was pinned behind Gallagher’s GMS Racing Chevrolet for the restart on Lap 147 of 150. Logano chased Larson to the checkered flag but couldn’t prevent the driver of the No. 42 Chip Ganassi Racing Chevrolet from scoring his first victory of the season, his second at Fontana and the sixth of his career. 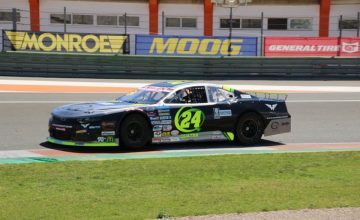 “The racing there at the end with Joey was awesome,” said Larson, a California native who got his first NASCAR XFINITY Series victory at the 2-mile track. “I had just a couple-lap fresher tires than he did, and I was able to chase him down. That was a lot of fun. Both the winner and the runner-up had obstacles to overcome. Larson recovered from a pit road speeding penalty to win the race. Logano sped on pit road and subsequently fell to the back of the field when the jack on the left side of his Ford dropped prematurely during an extended stay on pit road. But Logano — who led six times for a race-high 70 laps — was in prime position at the end, though he acknowledged that Gallagher’s two-tire call deprived him of the chance to overtake Larson. “What’s his number? 23?” Logano asked. “Yeah, I don’t know about that move. That wasn’t a good move. I don’t know what they were thinking, but that maybe wasn’t the best play at this race track. I knew he was going to spin them (his tires). There’s no way he couldn’t. It wasn’t his fault. Kyle Busch led 55 laps and finished third after scraping the wall on Lap 122 while in pursuit of Logano, who was leading at the time. Erik Jones ran fourth and Sunoco rookie William Byron fifth as the highest-finishing series regular. The action-filled race wasn’t without a number of hard crashes. Paul Menard’s Chevrolet nosed hard into the outside wall after contact from Jones, who appeared to misjudge his Turn 4 exit on Lap 94. Cole Custer took a wild ride when he clobbered the Turn 1 wall with an assist from Ryan Sieg — and was upset when he exited the car. The incident left him with a wrecked car for the second straight week. Notes: Byron is second in the series standings, 17 points behind seventh-place finisher Elliott Sadler… Darrell Wallace Jr. finished sixth for the fourth-straight race… Busch won both the first and second stages of the race, earning a total of two playoff points toward the owner’s championship.